Dorset’s oldest animal rescue centre is the latest recipient of a donation from the joint Yellow Buses/ Daily Echo Carbon Stoppers initiative. Margaret Green Animal Rescue received £200 which will go towards its work caring for a variety of rescued pets. 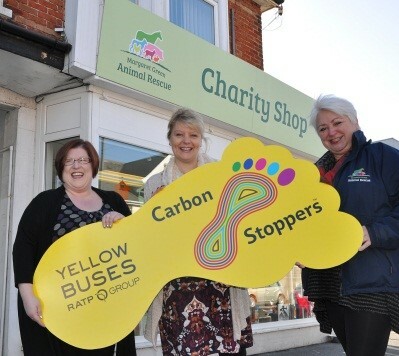 The Carbon Stoppers initiative has handed out nearly £20,000 to charities and good causes since its launch in 2008. Each week the Yellow Buses holds a ‘Thank You Thursday’ when every trip taken by passengers on the day contributes to a separately administered Community Chest. Jenni Wilkinson from the animal charity received the cheque at its shop in Wimborne Road, Winton. She said: “It’s a perfect partnership, many of our shop staff and volunteers travel by bus and we’d like to encourage our customers to use the bus too. “There is a bus stop right by the shop, making it so much easier to carry bargains home”. The charity, based in Church Knowle, rehomes 1,300 animals a year; from rabbits and cats to donkeys and horses. And it relies on donations to operate. Fiona Harwood from Yellow Buses said: “We try and donate to local good causes and Margaret Green Animal Rescue is a long-standing Dorset charity.